Welcome to part three of the DirectX native C++ tutorials. In this part we’re going to look at drawing a set of 3D triangles. These triangles will make up a cube and the camera will be positioned inside of it (like you’re standing in a square room). While the last tutorial technically had a 3D triangle – after all, we specified z coordinates for every vertex – the scene was not truly 3D as far as DirectX is concerned. Try changing the z coordinate for any of those vertices and you’ll see what I mean – the triangle still doesn’t look like it’s in perspective. 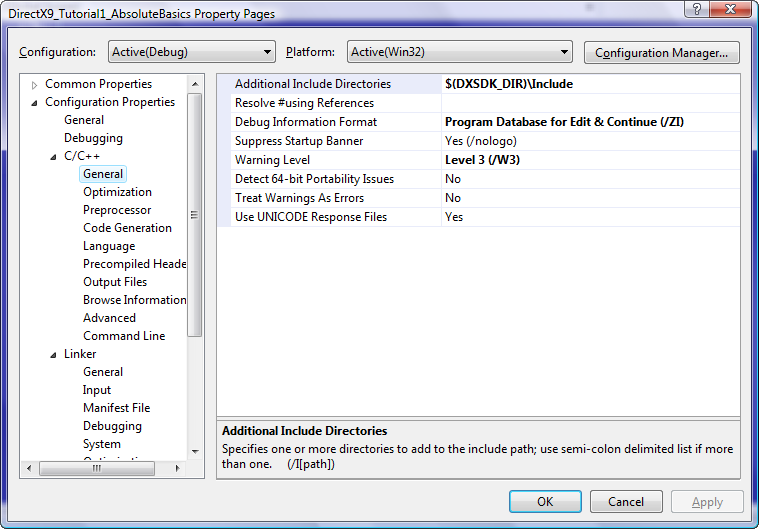 The tutorial sample code was built and tested with Visual Studio Express 2008. However, using the code “as-is” in Visual Studio 2005 should work too. You’ll need the DirectX 9 SDK for compiling the sample code. Use this link for downloading: click here. DirectX needs three matrices in order to render a true 3D scene – a world transformation matrix, a camera view matrix, and a projection matrix. If you’re unfamiliar with mathematical matrices, read the next section for a brief introduction. Those already seasoned in this subject can just skip it. This is known as a 4-by-4 matrix since it has four columns and four rows. It doesn’t necessarily have to be a square – an m-by-n matrix is quite common. However, the world, view, and projection matrices are all squares (4×4). Just like regular numbers, matrices can be multiplied together or added to one another. A matrix like the one above is known as an identity matrix because of this special property: some matrix (let’s call it “M”) multiplied by an identity results in the same M matrix. For the sake of discussion, let’s call the bigger matrix “A” and the one column matrix “B.” The values in each row of A are multiplied by the values in B and the results are summed making a matrix with the same dimensions as B. Try multiplying these two matrices as described above and you’ll find that it evaluates to exactly the same as the long-hand version. In other words, we can rotate any 2D point just by multiplying it with this 2-by-2 matrix! The same holds true for 3D points – we multiply them against a 3-by-3 matrix to get the newly rotated point (however, the 3-by-3 rotation matrix is much more complicated than its 2D counterpart as you’ll see shortly). Note that this time the y component stays the same and that x’ (the result of rotation #1) is used to calculate the new position instead of the original x. To do a third rotation, around the x-axis, the same equations would apply except Zrot and Yrot would be used as inputs (Xrot would stay the same). Now here’s the drawback to doing it brute-force versus using a matrix: we’re always rotating around one of the three coordinate system axes. What if we want to rotate a point around some arbitrary vector instead of the x, y, or z axis? Using the long-hand equations to do that gets extremely complicated. However, there is one kind of matrix you can construct that, if multiplied by a 3-by-1 matrix representing a point, will result in a new 3-by-1 matrix containing values for the rotated point! It may look scary at first, but you really only need to plug in two things: the components for vector V (which is the vector you want to rotate the point around) and Θ (the angle you want the point rotated). Note, however, that vector V must be normalized (it’s length must equal 1) for this matrix to work. There’s another special property to this matrix – after plugging in your angle/vector combination and calculating the number values for each element, those numbers actually represent vectors themselves – each column corresponds to a vector (so three total). These three vectors have one special property – they’re always perpendicular to each other. That’s right, no matter what angle or V vector you plug in, you’ll always end of with three vectors that are aligned just like the x, y, z coordinate system axes. But there’s more! If you were to rotate the coordinate system axes around vector V by your angle, the new coordinate system axis vectors would match the vectors contained in each column of this matrix! Can you see now what this matrix is really doing? The X vector, column one, holds the new x-axis after rotation. Column two, vector Y, holds the new y-axis after rotation. And as you can probably guess, column three, vector Z, holds the new z-axis after rotation. With just this one matrix you can specify not only how much to rotate a point, but also how to translate that point as well! A matrix which combines rotation and translation is called a “transformation” matrix. As you can probably guess, this type of matrix moves a 3D world around the player. Now that you’ve had an introduction to matrices and how a transformation matrix works, we can move on to the rest of the tutorial. As usual we’re going to build off of the example program from the last tutorial. Details about creating a window, setting up DirectX, and drawing a 2D triangle will not be covered here. If you need to know about those things, then I suggest reading the previous tutorial before moving on. Also, the example program for this segment uses DirectInput to capture keystrokes from the user. I won’t be covering details on DirectInput, but those parts of the code are clearly marked. Also, unlike some of the previous posts, I won’t include a full listing – the code has simply grown too large. However, I will go over all the pertinent parts so you can learn the most from this tutorial. Anything that was changed or modified will be shown. The code in the last tutorial drew a simple 2D triangle on the screen. Even though we specified a z-coordinate for each vertex of that triangle, it was still not really 3D. Changing the z-coordinate for any of the vertices still didn’t draw the triangle in perspective. Why is this? The vertex type used was D3DFVF_XYZRHW – the type used for pre-transformed vertices. DirectX expects these vertex types to have already gone through a 3D transformation pipeline. Once through the pipeline, z-coordinates become irrelevant – only screen coordinates (x and y) are used. Feed the following matrices to DirectX so it knows how to transform the vertices from world space to the screen: world transformation matrix, view matrix, and projection matrix. Change the vertex types to D3DFVF_XYZ – these vertices are untransformed and relative to world space. The world transformation matrix tells DirectX how to rotate, translate, and possibly scale 3D model coordinates into world space. In a typical 3D video game, polygonal models are the objects which tend to be reused in different parts of the world (weapons, bonus items, enemy players, monsters, etc.). Their vertices are defined relative to their own local coordinate system. The world transformation matrix converts these local coordinates into absolute positions in the 3D world (hence the name). The view matrix (sometimes called the camera matrix, or camera-view matrix) tells DirectX how to transform world coordinates into camera coordinates (basically, where are you and what are you looking at). The world coordinates become relative to the camera axes after this matrix is applied. If you have some experience in 3D graphics programming, don’t confuse the world matrix with the view matrix. Many tutorials and books about graphics sometimes refer to the world matrix and view matrix as one of the same. This is due to a certain optimization that can be done where you combine the world matrix and the view matrix into one master transformation matrix resulting in just one matrix update per frame instead of two. The projection matrix tells DirectX about your 2D viewport into the 3D world. It holds the following information about the screen and camera: field of view, aspect ratio of the screen, how far the camera can see (far clipping plane), and how near the camera can see (near clipping plane). The process of creating a world, view, and projection matrix isn’t difficult – if you use the Direct3D Extensions Utility library. Among other things, this library contains a few useful functions that return fully populated matrices given certain parameters. For example, provide an angle for the D3DXMatrixRotationY() function, and it will return a world transformation matrix that does rotation around the y-axis. If you ever need to calculate these matrices yourself, without the library’s help, you can refer to DirectX’s SDK documentation – it contains the layout and formulas for each matrix. The order in which you feed these matrices to DirectX is irrelevant – although it internally applies them to the scene in the same order (world -> view -> projection). Since the order doesn’t matter, we set the projection matrix at initialization time and then forget about it. This matrix would only need to change if the screen’s aspect ratio, field of view, or clipping planes were altered. Field of view (in radians). Z-value of the near clip plane. Z-value of the far clip plane. These values go in parameters two through five, respectively. The first parameter holds a pointer to the matrix object which will receive the result. The last line calls SetTransform(). This function is used to feed DirectX all the different types of matrices. The first parameter distinguishes which matrix type you want to set. D3DTS_PROJECTION indicates a projection matrix is contained in the second parameter. I used the function call instead for clarity, but both methods are equivalent. In this function we must give DirectX two points and something called an “up” vector. The first point is the camera’s position – its location in 3D space. The second is any point along the camera’s direct line-of-sight – in other words, any point that, if you were to look through the camera, would be centered in the camera’s field of view. DirectX simply uses these two points to calculate the camera’s view vector – what direction the camera is pointing. Since the look-at point can be any point along the camera’s line-of-sight, I just use the sine and cosine functions to calculate some point directly in front of the camera. The y-coordinate doesn’t change because, in this example program, I’ve tried to keep things simple and not allowed the camera to look up or down (only side-to-side). The “up” vector defines which direction points directly up from the camera’s point of view. You may be wondering why the up-vector is needed if we already have two points describing the camera’s direction. Here’s why: suppose that the camera is looking straight ahead, directly down the z-axis. Now turn the camera up-side down (in other words, rotate it 180 degrees around the z-axis). Did the camera’s viewing direction change? Nope. What if the camera was turned side-ways (or rotated 90 degrees around the z-axis)? Even then, the viewing direction doesn’t change (it’s still looking down the z-axis). So using just two points gives enough information to know where the camera is pointing, but it doesn’t describe the “roll” of the camera relative to itself. In this tutorial I haven’t allowed the camera to roll over, so the up-vector stays at (0, 1, 0) – in other words, the camera can’t look up or down. Once we’ve created the camera point, look-at point, and up-vector, we pass all of them to D3DXMatrixLookAtLH() – a function that calculates a view/camera matrix and puts it into the first parameter, ViewMatrix. Finally we call SetTransform() to feed DirectX our newly calculated matrix. The first parameter, D3DTS_VIEW, tells DirectX to use this matrix as the view/camera matrix. The second parameter is a pointer to the matrix itself. This time we don’t need the “rhw” component. We’re feeding DirectX non-transformed vertices so therefore a “w” component doesn’t apply. DirectX just needs the (x, y, z) components and the color of each vertex. Once we’ve filled in all the vertices, we must feed them to DirectX. The code which feeds DirectX is exactly the same as before (see last tutorial) with one exception – the vertex format is different. The vertex type, D3DFVF_XYZRHW, gets replaced with D3DFVF_XYZ because we’re feeding in (x, y, z) components instead of (x, y, z, 1/w). I’m not going to go into the inner-workings on this code because it was already covered in the last tutorial. Now we’re ready to render the scene. Again, this code looks much like the last tutorial except the vertex format has changed, plus, we’re now calculating the transformation matrices before rendering. This time around, when we call SetFVF(), we supply the (x, y, z) vertex format instead of (x, y, z, 1/w) using the D3DFVF_XYZ constant as opposed to D3DFVF_XYZRHW. Also, we call CalcMatrices() before drawing any primitives so DirectX knows which transformations to apply to the scene. The rest of the code behaves exactly the same as the last tutorial, so I’m not going to cover it again. The tutorial program uses DirectX/DirectInput to capture keyboard actions, but I’m not going to cover how DirectInput works here. Instead, I’m going to show how the program reacts to different key presses. The function HandleKeys() is called on every frame and is responsible for updating the global camera position tracking variables depending on the keyboard state. Walking forward and backward is a simple matter of updating the camera’s (x, z) position. We don’t update the y-coordinate because there’s no way to “jump” or float in the air for this example. If we were using a polar coordinate system (where point positions are based on angle and ray length), moving the camera forward or backward would be easy – just increase or decrease the ray length. But since we’re in the rectangular coordinate system (where point positions are determined by x, y, and z), we must convert this increase or decrease of ray length into the (x, z) equivalent. We do this with the sine/cosine functions and then add the result to the camera’s last position in order to get the new position (or subtract from the camera’s last position if we’re moving backwards). I’m not going to get into the basics of simple trigonometry, but if you want a detailed explanation of how these trajectory formulas work, email me through the Contact page. Strafing, or side-stepping, is done just like moving forward or backwards except the angle used in the calculation is 90 degrees plus or minus the camera’s real angle. If you’re moving left the angle is plus 90, and if you’re moving backwards, the angle is minus 90. For looking left or right we just add or subtract from the camera’s current angle to get the new angle. However, we must check to make sure the angle hasn’t “overflowed” or gone below zero. After all, a circle has a maximum of 360 degrees – so rotating by 370 degrees is really the same as rotating by just 10 degrees. Same goes for the other side – rotating by negative 10 gets you to the same point as +350. All this updating of the camera’s global position/orientation object is eventually used by the CalcMatrices() function in order to create a new view matrix on every frame. In other words, DirectX always has the most current camera position and renders the room based on the camera position controlled by the keyboard. Wow, this post ended up being _way_ longer than expected! Anyway, if you have any questions about any of the material covered, please post a comment or send me an email through my Contact page. In this tutorial we’re going to look at how to draw a stationary triangle using DirectX 9 and C++. We’ll be building off of the concepts taught in the first tutorial (DirectX 9 C++ Graphics Tutorial 1: Getting Started). Most of the code will be the same since it involves setting up a form and initializing DirectX. I’m not going to cover the Win32 initialization code or how to initialize DirectX in this tutorial. For that, see the previous tutorial: DirectX 9 C++ Graphics Tutorial 1: Getting Started. The only difference between this tutorial’s code versus the last version is how we handle WM_PAINT messages. Previously, we simply cleared the color buffer and displayed it on the screen. This time we’re going to define three triangle vertices, create a vertex buffer, send that vertex buffer to DirectX, and finally tell DirectX to render the triangle. In DirectX there is no pre-defined vertex type or object. You have to make your own struct (or class) and then tell DirectX about its format via FVF (Flexible Vertex Format) codes. FVF codes are a set of constants that describe the contents and size of a vertex structure. For example, the constant D3DFVF_XYZ describes your structure as having three float variables representing an untransformed vertex; the constant D3DFVF_DIFFUSE describes a single DWORD value representing a diffuse color component in ARGB order. You can (and often will) combine a set of FVF code together. For instance, “D3DFVF_XYZ|D3DFVF_DIFFUSE” means your structure has three float variables followed by one DWORD variable. The correlation between constant and vertex layout is clearly defined in the DirectX SDK documentation. “D3DFVF_XYZRHW|D3DFVF_DIFFUSE” – transformed position with color info. In this code we really just define a vertex array (“vertices”) and fill in the values for a triangle. The first two lines just declare the pointers we’re going to use. The next line calls a DirectX function called CreateVertexBuffer(). This function allocates a vertex buffer object which we’ll use for all buffer operations. CreateVertexBuffer() takes six parameters. The first parameter tells DirectX the required size of the vertex buffer (in bytes). The second parameter specifies how the vertex buffer will be used – “0” being the default. The third parameter tells DirectX about the memory layout of each vertex (the FVF format). The fourth parameter says that you don’t care where memory is allocated. The fifth parameter is the address of a pointer to be filled with the vertex buffer object location. Lastly, the sixth parameter specifies a shared handle (don’t worry about this). Now we use our newly created vertex buffer object and call its Lock() method. This call gives us a memory buffer (pointed to by pVertexBuffer) that we must copy our vertex data into. I know this seems strange – we already created our own vertex array, filled it with data, now we have to copy it somewhere else? Don’t ask why, this is just how DirectX works. The next line, with the call to memcpy(), does this copying process. Finally, when we’re done with the copy, we have to tell DirectX that the data is ready to go. This is done via the Unlock() method of the vertex buffer object. First, we clear the background to black by calling Clear(). You might recognize this from the previous tutorial (it’s the exact same call, but the color is different). 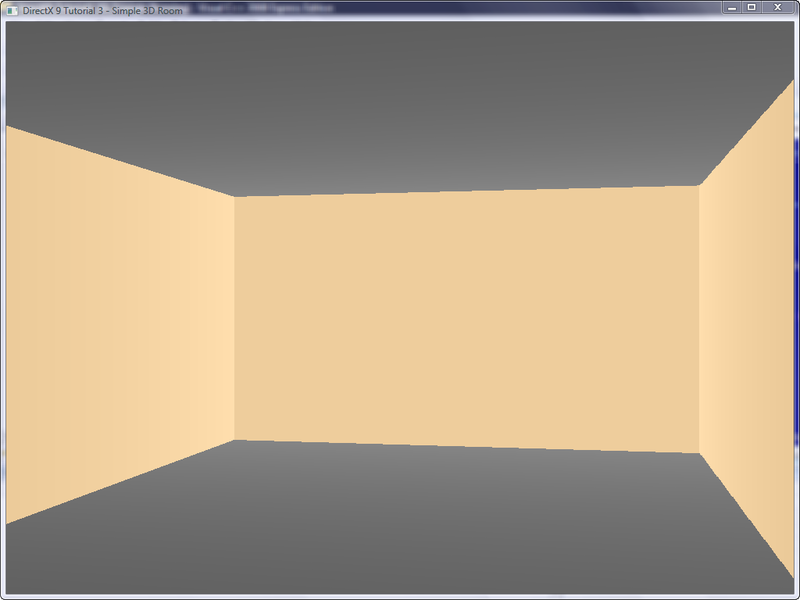 Next we call BeginScene() – every 3D frame in DirectX begins with this call. The next two lines set the stream source and vertex format. SetStreamSource() tells DirectX to take the vertex information from our vertex buffer object. The first parameter specifies the stream number and the second is a pointer to the vertex buffer object itself. The third parameter says there is no offset from the beginning of the stream to the vertex data (if there was, this value would be the number of bytes in between). Finally, the fourth parameter is the size, in bytes, of each vertex. SetFVF() sets the FVF code that describes our vertex format (see “D3DFVF” in the DirectX SDK documentation for all the possible code combinations and their corresponding formats). Now we’re at DrawPrimitive(). This tells DirectX to actually draw something. The first parameter specifies what to draw – in our case, a list of triangles (actually, just one triangle since our list only contains one element). The second parameter says start from vertex zero (in some cases you may want to start from somewhere other than the beginning). And the last parameter tells DirectX how many primitives to draw (for us, just one triangle). Once all the drawing code is executed, we must call EndScene(). All 3D scenes in DirectX end with this call. Finally we call Present() to display everything on the screen and call Release() on our vertex buffer object (since it’s no longer needed). ValidateRect() is from the first tutorial. It tells Windows that we’ve handled all of the drawing in this window and Win32 doesn’t need to do any further processing. Notice how the colors of each vertex are “smoothed” over the face of the triangle. This is the default behavior of DirectX (and even OpenGL). Since colors are only defined for the vertices and not the face of the polygon, DirectX interpolates the color in between. This interpolation gives you the gradient effect. Now that’s definitely better than the last tutorial of simply drawing a solid color on a form. However, the triangle is technically still 2D. If it were a 3D triangle we could adjust the z coordinate at each vertex, giving them different depths, and watch the triangle get drawn in perspective. Currently that’s not possible with this code. In order to turn it into a “real” 3D triangle, we need a camera position, a transformation matrix, and a couple other components. We’ll be discussing all this in the next DirectX C++ tutorial. However, for the very next post, I’ll go over the Managed DirectX version of this same stuff using C#. In this post I’m going to cover writing the most basic DirectX 9 application in native C++. You’ll see how to paint a solid color on a form as well as the minimum amount of code all DirectX 9 applications must have. Note: when I refer to DirectX, unless otherwise specified, I’m strictly referring to the graphics portion of it – Direct3D. This post is going to be one of a series. I’m going to cover writing simple DirectX 9 applications in C++ and I’ll also cover how to write those same applications with Managed DirectX (MDX 1.1) in C#. These posts will alternate – one in C++, one in C#, back to C++, and so on. After this, I’ll eventually cover some DirectX 10 stuff in C++ (which can be vastly different from DirectX 9 in certain areas). There is no MDX equivalent of the C++ DX10 API – the XNA Framework is meant to replace MDX since Microsoft dropped support for the MDX 2.0 Beta project. However, I’m not sure if XNA is mature enough yet to be able to do all of things originally included in MDX 2.0. I’ll explore that issue in a future post. 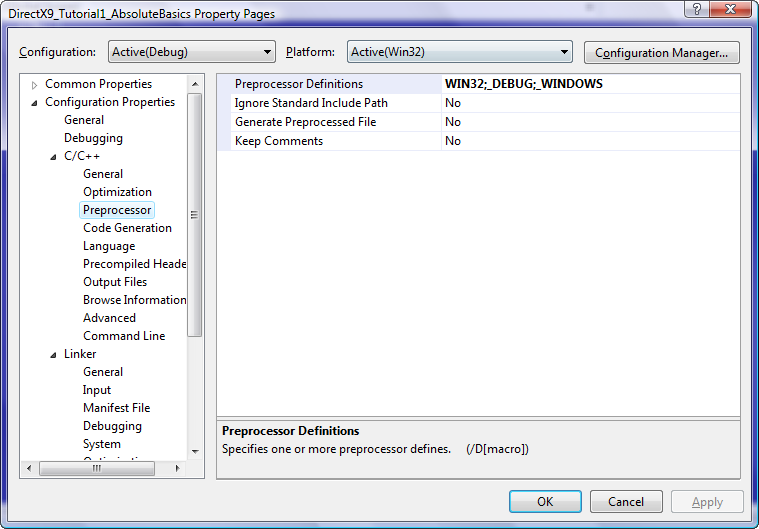 The steps and screenshots in this tutorial are based on Visual Studio 2008 Express. However, everything was also tested in Visual Studio 2005 Professional. You’ll need the DirectX SDK to run the sample programs. You can download it from Microsoft’s site with this link. Note, however, that their latest release (which is November 2007 at the time of this writing) took out the MDX 1.1 samples and documentation. If you still want those, download the August 2007 release or earlier (I use the June release). If you follow this tutorial’s instructions exactly as specified, you should end up with the same code and output. However, copying and pasting from a web page to Visual Studio sometimes results in double spaces between lines where it wasn’t intended. In almost all cases C++ doesn’t care and your code will still compile perfectly fine (a multi-line macro is one of those rare exceptions). Create an empty project and add one source file called “main.cpp” (you can actually name it anything you want, but I’m going to refer to this file as “main.cpp” throughout the text). All the other defaults are fine. Save these settings and move on to the next step. Since the purpose of this tutorial is to go over DirectX and not basic Win32 programming, I’m going to keep the following description of the code brief. There are many Win32 tutorials on the internet that explain in extreme detail the low-level aspects of Win32. In addition to these steps, all Windows programs must have something called a “message pump.” This is the mechanism in which the Win32 subsystem sends your application events about what is happening on the outside (i.e., what the user is doing in your app, global events of the operating system – such as starting to reboot, etc.). Your application must either respond to these events or must pass them to the default Win32 event handler. How GDI should handle your application’s main window. A function pointer to your program’s message handler. The instance handle of your program. A background brush (this represents the background color, but technically it’s not required – your window will appear transparent if omitted). Class string (a unique string that identifies your Win32 class object to the rest of Windows). The WNDCLASSEX structure is used to hold this information. While there are more than five members in WNDCLASSEX, the code above specifies NULL or “0” for the properties in which Windows will take the default. The RegisterClassEx() function is used to send this information to the Win32 subsystem. The same class string used when calling RegisterClassEx(). The title of the form. The style of the form (dialog, tool window, etc.). The (x, y) position of the form and its size. The instance handle of your program (this should match the instance handle used when creating the class object). As long as no error is generated, the CreateWindow() function returns a handle to your window. NULL will be returned if an error occurred. The next step is take that window handle and call ShowWindow(). The first parameter specifies the window handle and the second parameter represents how the window is to be shown by default. We used the “nShow” variable as the second parameter – the forth argument to WinMain(). This allows Windows to tell us how the window should be shown based on how the application was launched. The next line calls UpdateWindow(), which is technically not required by a program this simple. It allows any post-updates to occur after the window is first drawn. We now get to the while() loop at the end of the main function. This loop is part of the “message pump” discussed earlier. If this loop wasn’t there your application would simply start and stop right away. There needs to be something that keeps your program running until it’s time to close. The “message pump” loop does exactly this. It continually checks for events from the Win32 subsystem by calling GetMessage() and subsequently passes them down to TranslateMessage() and DispatchMessage(). These two functions eventually route the events to WndProc() – your callback function specified in the windows class object. This function allows your program to execute whatever code is necessary in response to these events. If your application doesn’t need to respond to an event, it should pass it down to the default Win32 handler by calling DefWindowProc(). Let’s go through this line by line. First we create the DirectX object by calling Direct3DCreate9(). The first parameter, D3D_SDK_VERSION, is a special number that ensures an application was built against the correct header files. If the number doesn’t match, the call will fail. Next we declare and fill in a D3DPRESENT_PARAMETERS structure. This object holds properties about how an application should behave. In our sample, we want it to run in windowed mode and we want the video hardware to handle the back buffer instead of handling it ourselves (the full meaning of D3DSWAPEFFECT_DISCARD is beyond the scope of this tutorial, but basically it tells the device driver to select the most efficient way of handling swap chains). We then use the main DirectX object to call CreateDevice(). This function does the work of allocating the device object and associating that object with the 3D hardware (or software – depending on what parameters are specified). The first parameter, D3DADAPTER_DEFAULT, tells DirectX to take whatever graphics card is the default (typically the one and only piece of active video hardware connected to your motherboard). The second parameter, D3DDEVTYPE_HAL, tells DirectX to use 3D hardware, instead of a software emulator, for rendering. A software emulator becomes useful only for low-level debugging – don’t worry about it for now. The third parameter specifies the window handle that will receive the rendered output. D3DCREATE_SOFTWARE_VERTEXPROCESSING tells DirectX to use software for transformation calculations instead of hardware HTL (Hardware Transform & Lighting). If you had specified hardware transformation calculations instead, and the video card didn’t support HTL, then this function would fail. All new cards on the market today support HTL, and most have for quite a while. So unless your card is really old you can select hardware processing without any worries – just replace the existing constant with D3DCREATE_HARDWARE_VERTEXPROCESSING. The fifth parameter is a pointer to the D3DPRESENT_PARAMETERS object that we filled in right above the call. 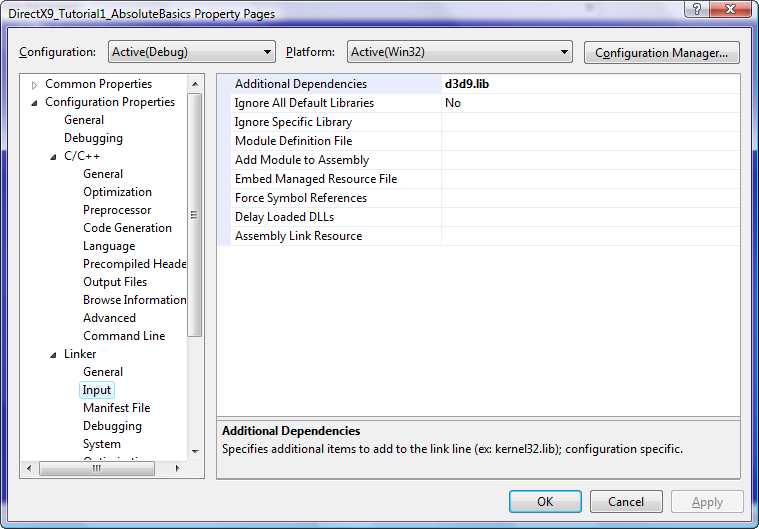 Lastly, the sixth parameter holds a pointer to the device object that will be created and returned by the function. Now that the device object is created, we can call its functions to control the video card! The next section will explain exactly how to do this. In this section we’ll see where the magic happens. While it’s not much – drawing a solid color in the window – you’ll see how to do more advanced stuff in the next few tutorials. ValidateRect() is called in order to tell Win32 that we’ve handled all of the rendering ourselves. The first call to Clear() tells DirectX to fill a specific rectangle, or set of rectangles, with a certain color. The first two parameters represent the number of rectangles and the address of where those rectangles are stored. If “0” and “NULL” are specified instead, DirectX will fill the entire rendering target. The third parameter, D3DCLEAR_TARGET, means we want to clear the actual pixel buffer as opposed to the depth buffer or stencil buffer. This parameter could also be used to clear a combination of those buffers at the same time. The last three parameters tell DirectX what values to use for clearing the pixel buffer, depth buffer, and stencil buffer. Since we’re not clearing the depth buffer or stencil buffer, the values for the last two parameters have no effect. Once everything has been rendered to the back buffer you display it on the screen by calling Present(). Parameters one and two represent the source and destination rectangles, respectively. Since we want the entire back buffer to get copied to the entire screen, we pass in NULL. The third parameter specifies which window to use for the display. When this parameter is NULL, Present() looks at what was originally set when creating the D3DPRESENT_PARAMETERS object (specifically the hDeviceWindow member). Since we didn’t specify anything in the beginning of our program, the memset() call would have set this member to NULL. When this happens, and windowed mode is set, Present() takes the focus window as its destination. We call Release() because these objects were given to us by DirectX via COM as opposed to being allocated with the “new” keyword or created with some memory allocation function. Therefore we must delete them through COM’s Release() function. OK, it’s not much at this point, but in the next few tutorials we’ll get into more exciting things. OK, I admit, the final output of this tutorial wasn’t too exciting, but it only strived to cover the absolute minimum – nothing more, nothing less. All 3D DirectX applications start off this way. If someone made a DirectX project template for Visual Studio, the wizard would more than likely generate very similar code to what you see here. In the next tutorial, we’ll see how to do the same thing in managed DirectX (MDX 1.1).